Sydney Atheists are planning a bus trip to increase the profile of atheism as legitimate viewpoint. 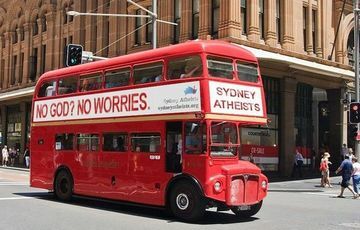 In the week before Easter we'll be visiting iconic place in Sydney in our own luxury transport, a double-decker London bus, prominently bearing our message "No god? No worries". We will also use the opportunity to deliver a petition on the National Chaplaincy to Julia Gillard in Kirribilli. On 2nd of April we will have fundraising dinner. It is at Cafe Well Connected on Glebe Pt Rd in Gelbe. The dinner is $50 ($30 with concession). At this dinner you'll have the opportunity to win two of the best seats in the bus, the front row, upstairs. This dinner will be on a first come first served basis, so if you want to get in, RSVP ASAP. Go to either our meetup, or our facebook page. If you cannot make it, but want to see the bus driving, feel free to donate. More details on the bus campaign will be made available closer to the event.